It's A Very Cherry World. Come join in! 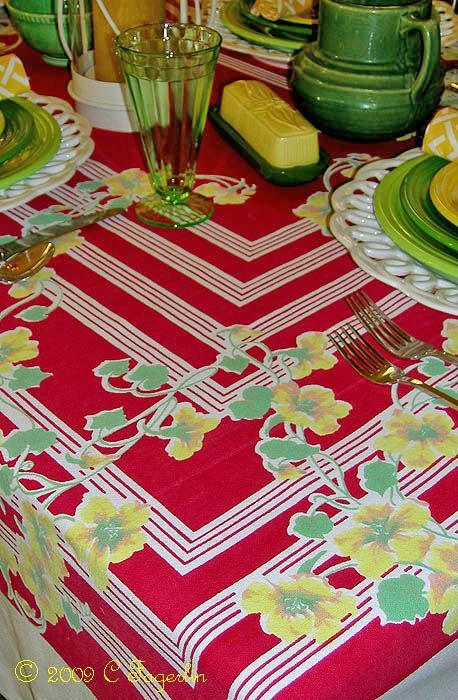 Vintage tablecloth with Post 86 Fiesta in Chartreuse, Shamrock and Sunflower. keep your butter fresh! 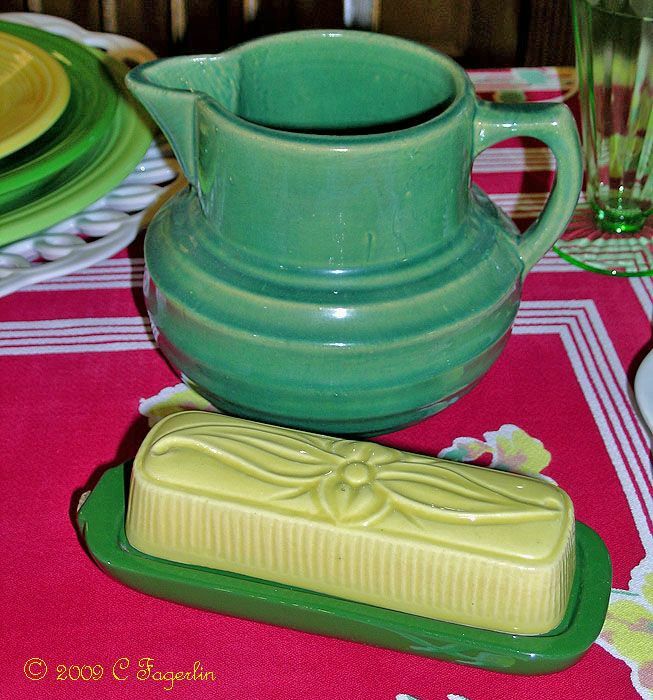 ), the green milk pitcher, and the green glassware. 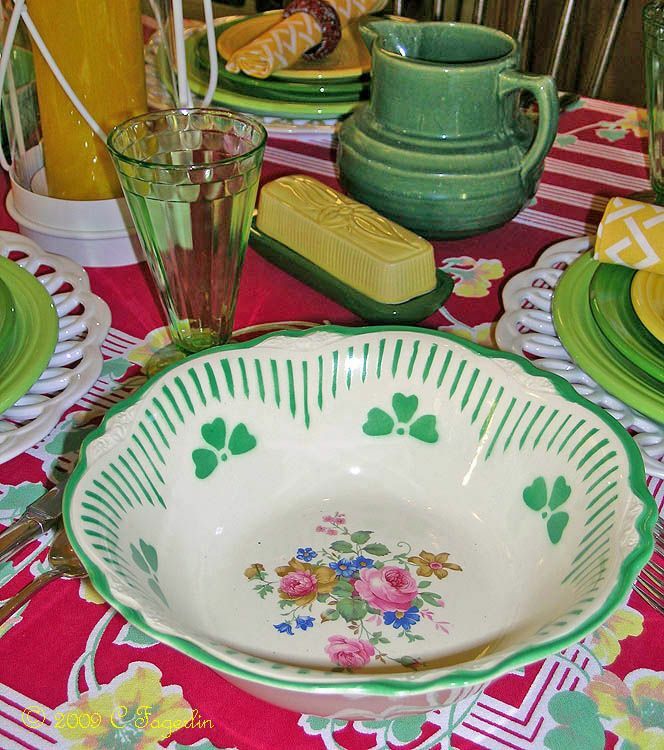 casserole, small green bowl and a specialty salad bowl with shamrocks and roses. 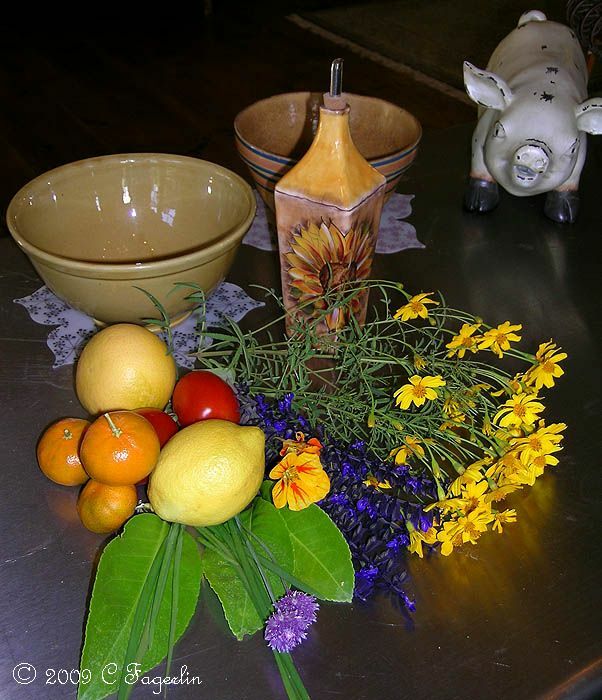 The original plan was to fill that pretty salad bowl with a salad of fresh butter lettuce, nasturtiums, and some Mandarin orange wedges. My nasturtiums were pretty much wiped out by a monsoon a month ago and they have given up the ghost for the season. These are the pitiful hangers on, certainly not enough for a salad. 3 Tablespoons Balsamic Vinegar - buy the good stuff, it goes a long way! Taste this and adjust to your own family's preference. 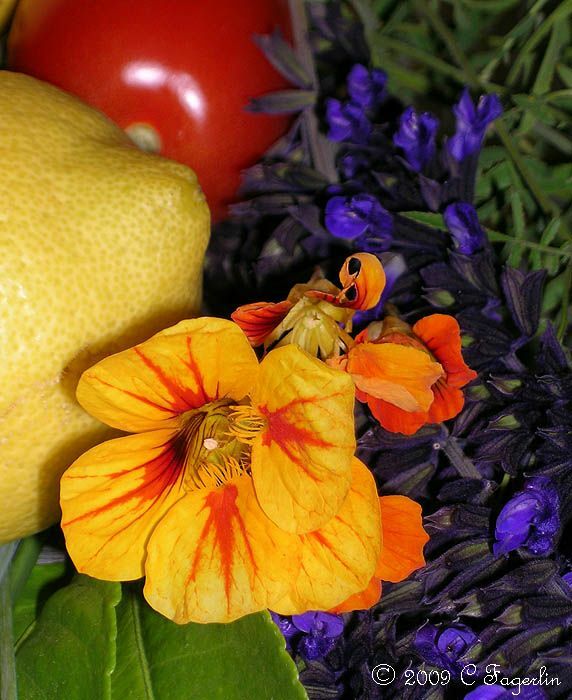 It's the fresh lemon juice that really brightens up any salad ingredients you might choose. It's a very tangy and crisp dressing! 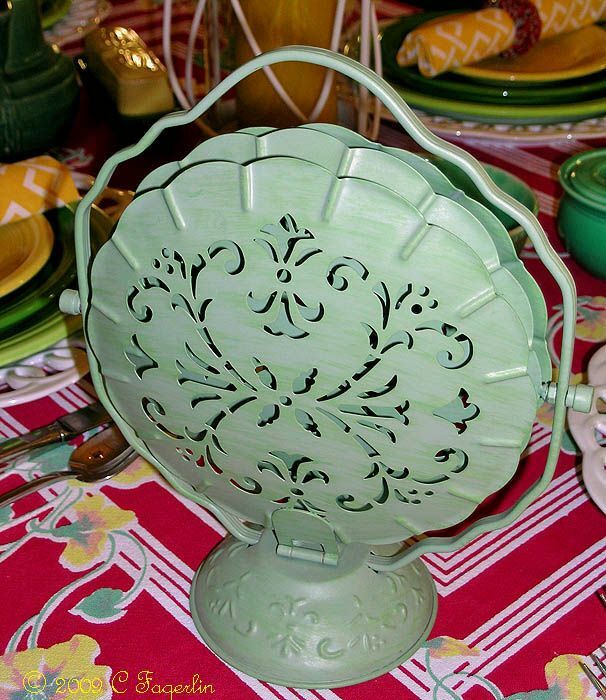 What a bright and cheery and Springy table you have set! 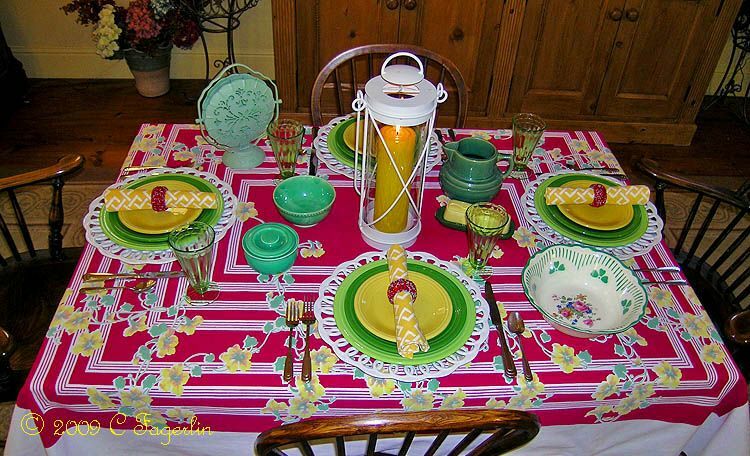 I love the yellow and green plates together, and the tablecloth is just stunning! Wonderful spring table! 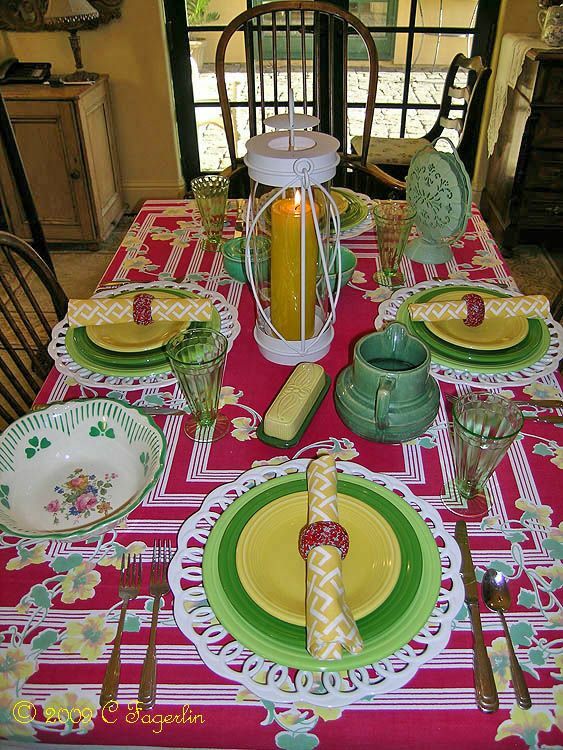 It would be lovely to eat a meal with this tablescape! 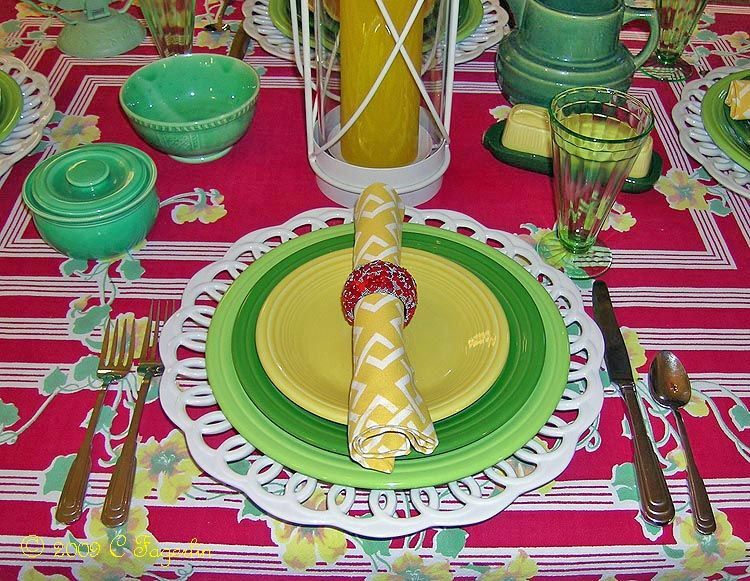 Pretty spring tablescape. Love your piggy in the last photo ... I think he's trying to say something! LOL!! 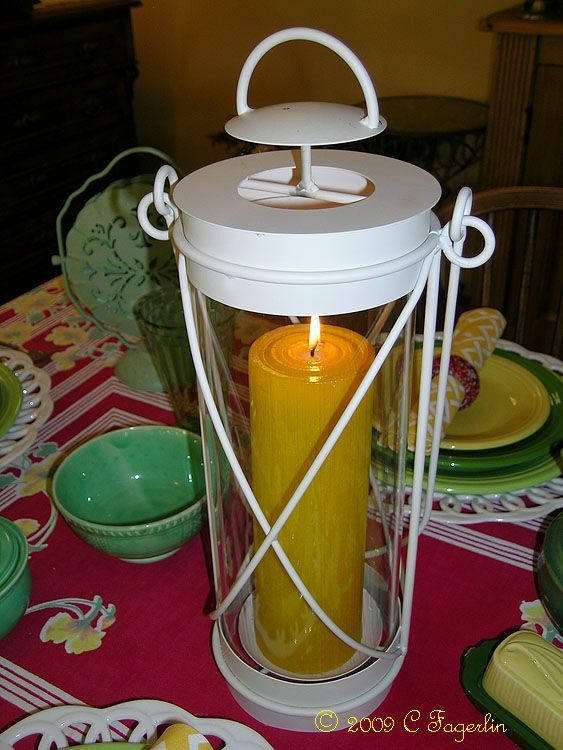 What a cheerful table setting! Love everything! I've never tried eating nasturtiums but there's always a first time. Such a colorful table! It is festive looking! Truly very bright and happy! 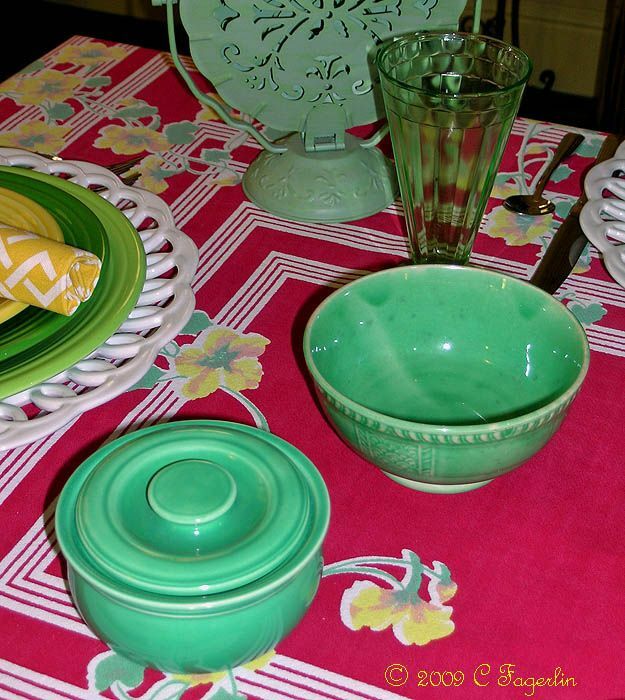 Love the dishes and glass ware! Hey, wait just a gosh darn tootin' minute!! That's not a round table! LOL! I love the cheeriness of your table today! Vintage china and tablecloth eye candy, Candy. I have a little Homer Laughlin in the Eggshell Nautilus. The pattern is "Aristocrat" that I favor the most. But, there are a number of close patterns I've picked up here and there. Sounds like I have a lot, but really only a half dozen 0r so sandwich plates. I wanted to ask you if the little girl in the sidebar pic from 1948 is you? She's a beautiful child, whoever she is. Somehow I missed this table! I love the red stripes! So glad you stopped by for some redness! LOL Sue ----- you are correct that is not a round table! The Little Round Table takes an needed break every once in awhile! It is a LITTLE round table and can only seat four, so the big guy comes along to take up the slack. Hi Mary! Yep, that would be me at about 5 .... picking wild flowers along a roadside in Bavaria. Ms Daphne, you really did miss it or just blanked it out ..... I think it was originally posted in November!!! See you all again next week I hope!